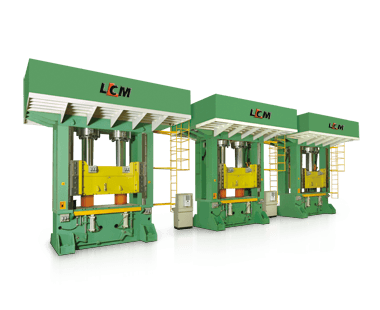 SMC Press widely used in aviation, aerospace, track vehicle, automobile, architecture, petrifaction, energy, electric and literary form producing, now SMC Press of Lien Chieh Machinery (LCM) mainly equipped with intelligent leveling system for manufacturing doors. Our Hydraulic SMC Press is highly productive, durable and can be availed in capacities ranging from 2500 Ton to 3000 Ton as per the requirements. Another one Hydraulic PU Injection Press can also be availed in capacities about 100 tons. Our machinery realizes that facilitate the action reliability, security and stability, and we can customize wider and higher SMC Press according to customers’ requirements. We are not only offering SMC Press also offer Hot Forging Press, Forming Press, Metal Forming Press, High Speed Press, and Mechanical Press, if you have any need about hydraulic press, please contact with our sales to get more information.